The DV8 Circuit Triple Roller is a top of the line triple roller. 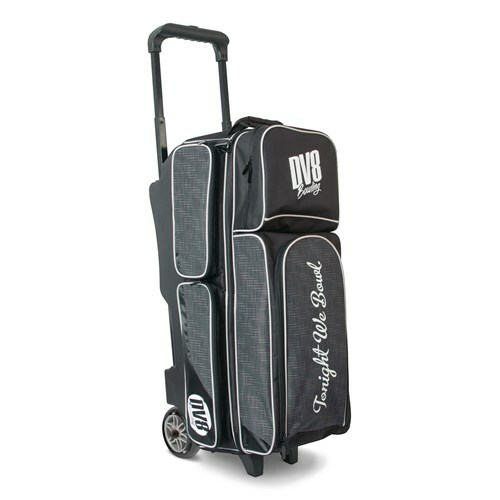 With high quality features like the urethane wheels, two large accessory pockets on each side, a separate shoe compartment that holds up to men's size 15 shoe, and a separate large top accessory pockets, you will have enough storage space for all of your bowling accessories and equipment. Hi Lani, all of the pockets and compartments on this bag are fixed and cannot be removed. how many bowling balls does it hold ? This particular bag will store 3 bowling balls. Due to the time it takes to produce the DV8 Circuit Triple Roller Grey ball it will ship in immediately. We cannot ship this ball outside the United States.